Variable Cylinder Management™ (VCM®) is programmed to run on three, four or six cylinders, based on the power requirement. Backed by the intelligence of i-VTEC® technology, VCM® quickly and seamlessly activates or deactivates two or three cylinders. So you get the best of both worlds: V-6 power when accelerating or climbing, and the efficiency of a smaller engine while cruising. The high-output, 3.5-liter, 24-valve, SOHC i-VTEC® V-6 engine produces 248 hp and an equally impressive 250 lb-ft of torque, giving the Odyssey strong performance, while maintaining exceptional fuel efficiency. 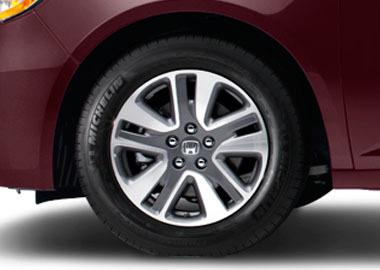 The 18-inch wheels of the Touring models have an athletic, stylish appearance. Third-row sunshades (Touring models) provide extra sun protection for long road trips or commutes. The removable front center console with storage (EX and above) features a convenient flip-up trash-bag ring. The Ultrawide Honda DVD Rear Entertainment System with HDMI® Technology features split-screen viewing on a 16.2-inch screen. Wireless headphones for each screen allow for quiet use. On models with navigation, the multi-angle rearview camera with guidelines makes it easy to back into parking spaces with extra precision. 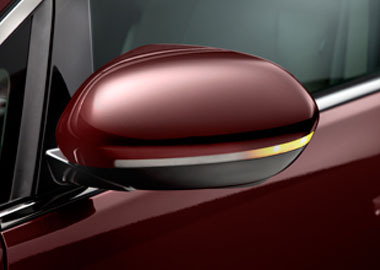 The standard rearview camera found on all other models also includes guidelines to help enhance visual accuracy. A small camera mounted at the top of the front windshield tracks lane markings on the road, and it can detect when the driver is making an un-indicated lane departure. Visual alerts will light up on the driver’s instrument panel and the system also can provide an audible warning. Odyssey models are available with up to five Lower Anchors and Tethers for Children (LATCH): three in the second-row seating positions (EX and above) and two in the outboard third-row seat positions. The LATCH system provides two lower anchors and an upper tether anchor. When used with a compatible child seat, the LATCH system provides attachment points between the child seat and the vehicle seat.